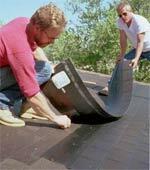 Different roof designs and materials are used for residential and commercial buildings. Commercial buildings typically use low-slope or flat roofs, while home roofs are sloped. The concerns regarding moisture, standing water, durability and appearance are different, reflected in the choices of roofing materials. Roof design can impact the building's thermal performance. For example, in a metal-framed building, the metal eaves can act as thermal fins, moving heat out of the building, which is not desirable in heating climates. A number of roofing choices are available for high-performance buildings. New solar roof shingles on the market today even produce electricity using solar technology. Reflective roofing materials or coatings help send the heat back into the sky rather than into the building. And recycled content shingles are available that look like slate or wood. Roofing materials should be integrated into the building's whole-building design.